International Journal of Research in Health Sciences,2014,2,1,101-110. 1MD Pharmacology, Lecturer, Terna Medical College, Navi Mumbai. 2MD Community Medicine, Assistant Professor, Seth G.S. Medical College, Parel, Mumbai. 3MD Pharmacology, Professor and Head, Department of Pharmacology, SVNGMC, Yavatmal. Background: Regular assessment of the changing profile of the microbial isolates and their resistance to various antimicrobials in use helps in formulating proper guidelines for the rational use of antimicrobials for the particular bacteria. Methods: The present study is an observational, longitudinal, descriptive type of drug utilization studyover the three financial years conducted in a tertiary care hospital in Central India. Antimicrobial resistance pattern and the annual consumption of the antimicrobial agents is obtained from the hospital data & compared by appropriate analytic method using Graph Pad Prism version 5.01 and Epi Info version 3.5 software. Results: Total 52,344 biological samples tested for culture positivity, out of which only 10,542 (20%) were showed growth of bacteria. Out of these 10,542 samples 18.8% were Gram positive organisms. The annual consumption of Aminopenicillin and Fluoroquinolone was high as compared to other antimicrobial agents. 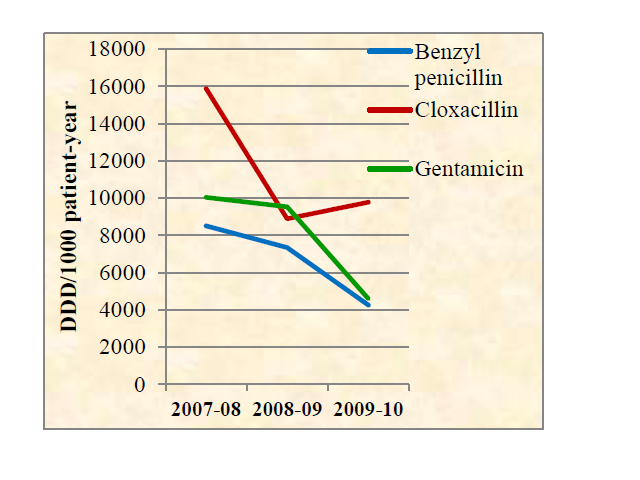 When the resistance pattern and annual consumption were compared with each other, positive trend was found in Benzyl penicillin, Gentamicin and Cloxacillin group with statistical significance of p<0.5. Conclusion: The observations of present study can help to improve the rational use of ABAs in indoor patients and also to curtail the economic burden of our tertiary care hospital. Hence, we expect that such type of studies should be done in every hospital to provide a base for formulating the local antibacterial guideline.